Back when I started writing this blog, I set a personal goal to record the recipes that I had grown up with. I didn’t want my descendants to encounter the same issues that I’d had when my grandmother passed away and took her knowledge of family favourites with her. 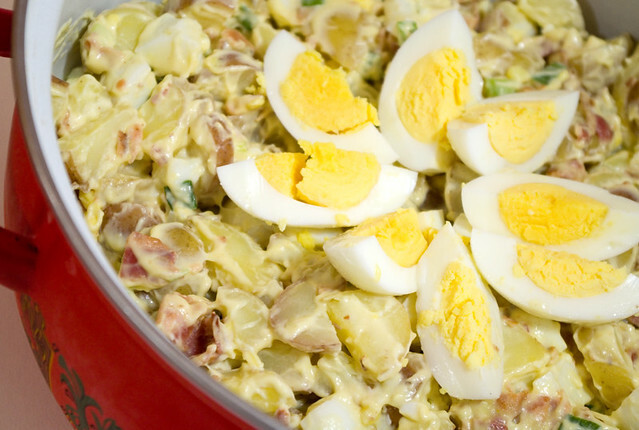 To this end, I asked my mother the other day for her potato salad recipe so that I could post in online (it’s one of my favourite summer dishes). Much to my dismay, she explained to me that she had no real recipe and added ingredients until it “looked right”. After telling me this, she laughed a bit, because she used to get frustrated with my Nan and her approach of “a little bit of this, a touch of that” dishes that were downright impossible for her to recreate. So Mom and I set aside some time at the cottage this summer to measure all her ingredients and record everything that she did to make her potato salad. 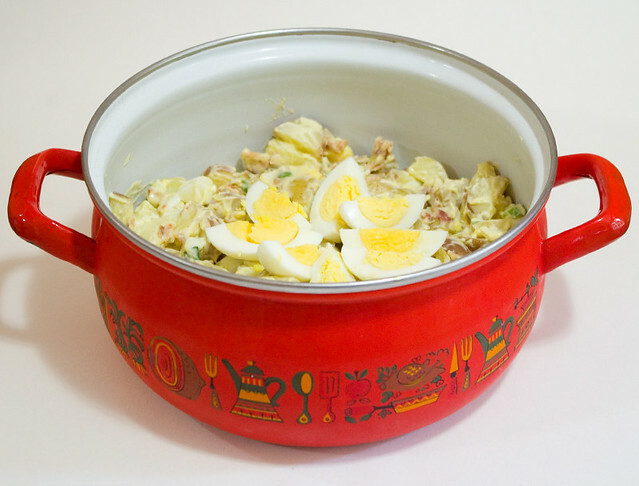 This one of her most often-requested potluck or barbecue dinner dishes, and indeed, it got rave reviews when I made her recipe for the most recent potluck. As a bonus, it is both simple and a great make-ahead dish. Actually, it’s easier to prepare the ingredients a day ahead, then combine them into the final dish on the day it will be served. It takes the pressure off of hosting when you know that at least one dish is ready and waiting in the fridge. Mom’s potato salad made fancier by leaving the potato skins on and including bacon bits. This recipe works well with both older and new potatoes. With older potatoes, peel before cutting. With new, thin-skinned potatoes, wash them and leave the skins on before cutting. Place the potatoes into a large pot and cover with water. Boil potatoes until they are soft enough to be pierced by a fork, but not yet mushy. Drain and refrigerate in a covered container until cool (this can be done overnight). Place eggs into cold water until they are cool to the touch. 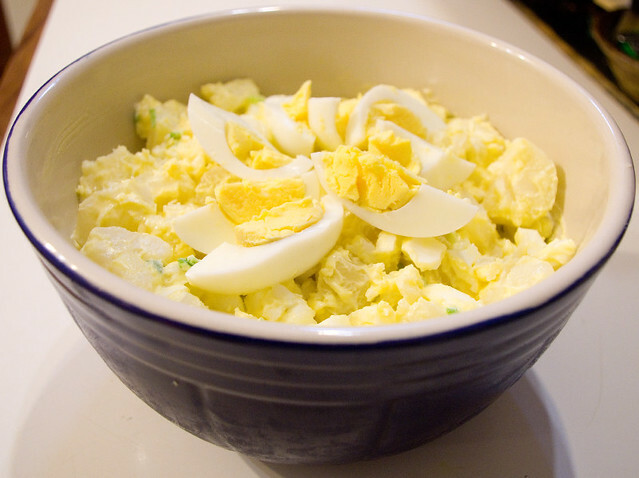 If assembling the salad the next day, the eggs can be left in their shells in the fridge overnight. Place the cooled potatoes into a large mixing bowl. Peel the eggs. Cut up 4 of the 6 eggs into bite-sized pieces (usually eighths or smaller), setting the two most aesthetically pleasing eggs aside as topping. Mix well until all ingredients are evenly coated. Cut into quarters the 2 eggs you set aside. 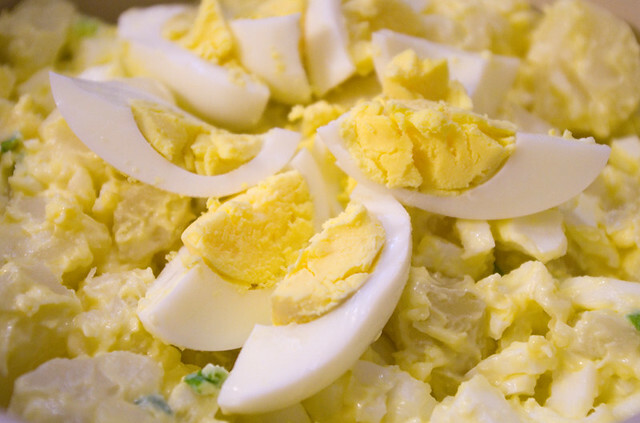 Arrange the eggs at the center of the salad in a sunburst pattern. This recipe may easily be multiplied in order to serve a larger number of people. *Regular, olive oil, reduced-fat, or reduced-fat olive oil mayonnaise are all acceptable. However, do NOT use salad dressing or Miracle Whip, the flavour is all wrong in this dish. **If you add reduced-salt bacon, halve the amount of salt in the recipe. I prefer the reduced-salt kind, but if you have to use regular bacon, don’t add any salt at all. Posted on August 30, 2017 September 4, 2018 by owntwohandsblogPosted in Cooking, RecipesTagged bacon, eggs, family, food, homemade, potatoes, potluck, recipe, salad, summer.